I love fruit , jello and I love quinoa. So here’s a few recipes that are delicious fast and easy. With a simple tart lemon vinaigrette, this quinoa-packed fruit salad comes together in just 15 minutes without turning on the stove. It’s a protein-packed salad that’s refreshing and deliciously filling. To make the vinaigrette, whisk together olive oil, apple cider vinegar, lemon zest and juice, and sugar in a small bowl; set aside. 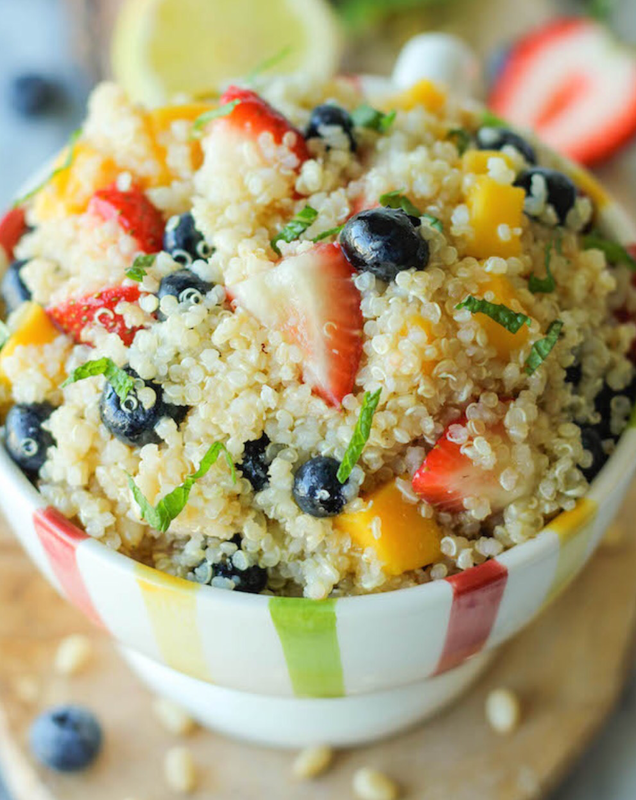 In a large bowl, combine quinoa, mango, strawberries, blueberries and pine nuts. Stir in lemon vinaigrette. Serve immediately, garnished with mint leaves. 1. Grate 1 teaspoon zest from one of the grapefruits and 2 teaspoons zest from one or two of the oranges. Set the zest aside. 2. Using a sharp knife, cut a thin slice off both the stem end and the blossom end of each grapefruit and orange to reveal the flesh. Stand a grapefruit upright on a work surface. Using a small, sharp knife, and working from the top to the bottom of the fruit, cut off the peel and white pith in wide strips, following the contour of the fruit. Invert the fruit and trim away any white pith on the opposite end. Repeat with the remaining grapefruit and all 4 oranges. Then cut the fruits crosswise into ¼-inch-thick slices and remove any seeds. 3. 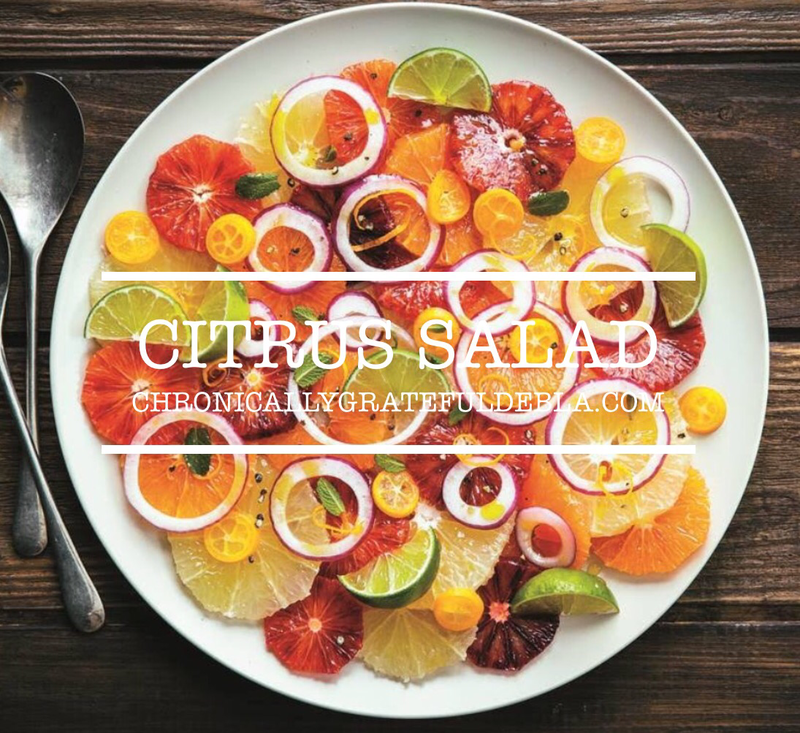 Arrange the citrus slices, alternating the colors, on a serving platter. Strew the onion evenly over the top. Set aside. 4. In a small bowl, whisk together the grapefruit and orange zests, then whisk in the oil, orange juice, vinegar and honey to make a vinaigrette. Season with salt and pepper. 5. Drizzle the vinaigrette evenly over the citrus and onion slices. Scatter the kumquats over the top and sprinkle with the chopped mint. Garnish with the lime wedges and mint leaves. Serve. * Bring 2 cups juice to a boil in a small saucepan over high heat. * Meanwhile, pour water into a large heatproof bowl. Sprinkle gelatin over the water; let stand for 3 minutes. * Add the juice and stir to completely dissolve the gelatin, 2 to 3 minutes. Add sugar and stir for 1 minute to dissolve. * Whisk in purple grape juice (or additional white grape juice).Refrigerate until the mixture is the consistency of thin pudding and is just starting to set around the edges, 1 to 1¾ hours. * The time will vary depending on the size of your bowl and how cold your refrigerator is. After 1 hour, start checking every 5 to 10 minutes because it thickens quickly after that.Gently but thoroughly whisk the mixture until it’s uniform. Ladle just enough into a 6-cup mold to cover the bottom by about ½ inch. 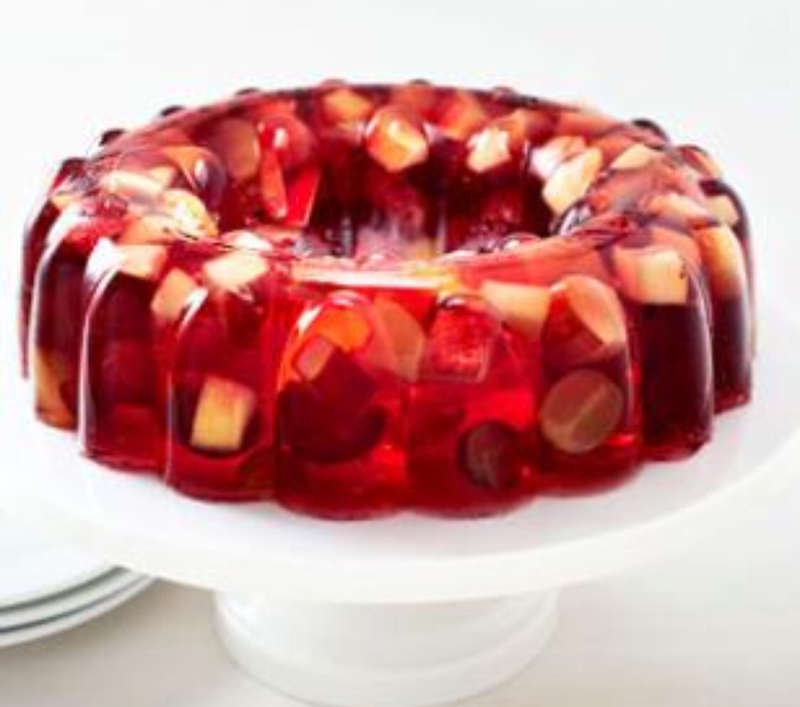 Nestle apples into the layer of jello, pushing it into any grooves in the mold. Gently ladle another thin layer of jello over the fruit to help hold it in place. Mix grapes into the remaining jello in the bowl. Gently ladle the mixture into the mold and smooth the top. Cover the mold with its top or with plastic wrap, without touching the jello.Refrigerate until very firm, about 4 hours. To test if it’s ready, touch it with your finger. If your finger does not stick, it’s done.To unmold, moisten fingertips and gently pull the top edges of the jello away from the mold. Fill a bowl with warm (but not hot) water; dip the mold just until the water nears the top. Hold it under for 20 seconds. Take it out of the water. Place a large plate over the mold. Holding the mold and plate together, invert and gently shake to loosen. Then slowly and gently pull the mold off. If the jello doesn’t come out, dip the mold back into the water for another 15 to 20 seconds to help loosen it from the sides. In a large bowl, dissolve gelatin in boiling water. Add ice cubes, oranges, pineapple and orange juice concentrate. Pour into a 6-cup ring mold coated with cooking spray. Refrigerate overnight or until firm. Just before serving, unmold onto a serving plate. Fill center with grapes and garnish with mint if desired. Yield: 12 servings. 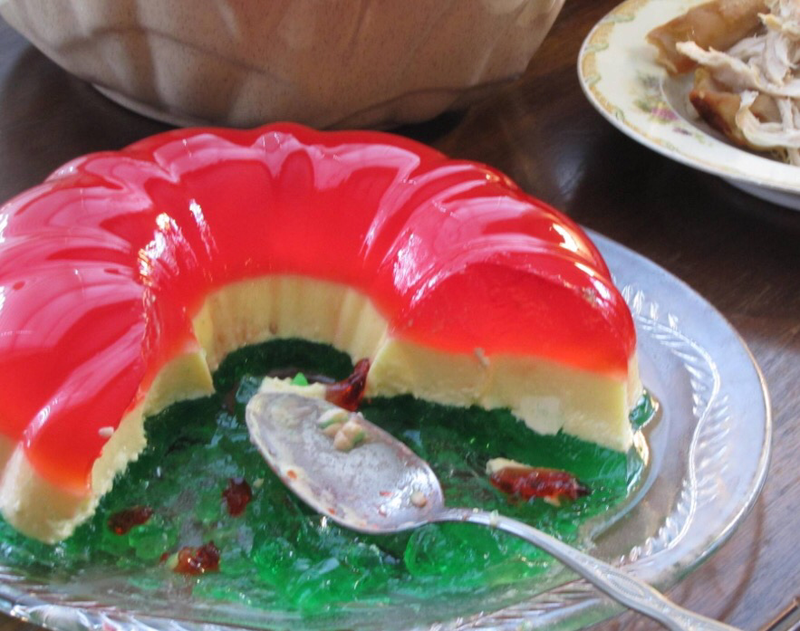 My grandmother made it year round even though it is a holiday Jello salad. I know it is easy to mock some of those creative concoctions but everyone who tries this one raves about it. The secret is the layer of cream cheese mixed with gelatin. Dissolve red gelatin in 2 cups boiling water; add 1 to no more than 1 1/2cups cold water. Pour into mold and refrigerate for four hours. When the red layer is firm, dissolve lemon gelatin in 2 cups of boiling water. Mix the cream cheese and half-and-half together. Add to the lemon gelatin, pour over the red layer and refrigerate until firm. Dissolve lime gelatin in 2 cups of boiling water. Add 1 1/2 cups cold water and pour over the cream cheese layer. Refrigerate until firm. 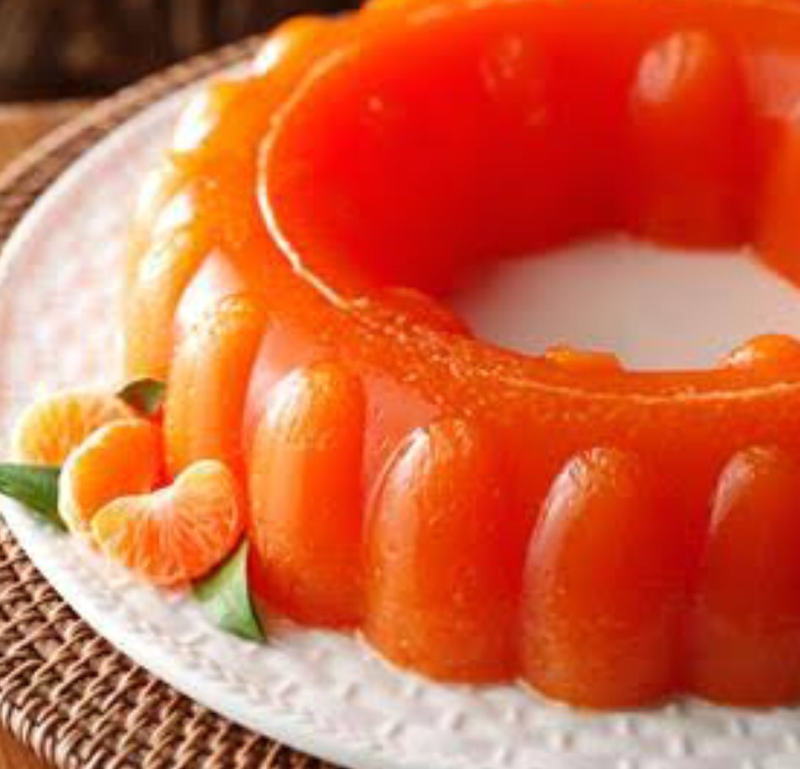 This makes a very large Jello salad (I used a bundt cake pan as the mold for the salad in the photo). For a smaller salad, just cut the ingredients in half. 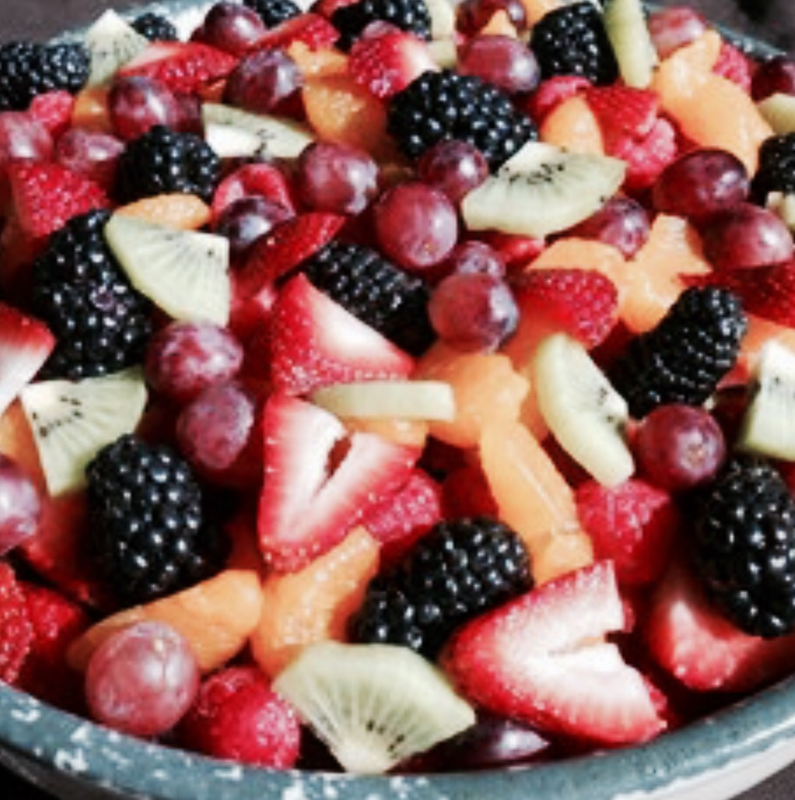 The fruit salads looks delish, especially the one with the quinoa.